Are you trying to build a train? The main use will be to add my home made resse caddy to the back of a trailer for an additional few square feet of deck space. I made it back in 2007 to carry a few fuel tanks and it hasn't seen much action since I got the trailer. I will add a flat 4 connector to the back of my trailer, just incase I pull a second trailer. My 5x8 trailer is bigger than a pickup bed, and at a much nicer height. What's more fun than getting over 30 mpg with an LGT? Hauling a yard and a half of dirt with it and shoveling it out without any climbing! I'd be leery of mounting something off the back of it, though. The camper people have looked at doing hitch mounted bike racks off the back of their smaller campers and frown on it- the rear bumper of a small trailer gets tossed around a lot more than the rear bumper of the tow vehicle, so the weight hanging off the back gets whipped around even more. A tongue mount for the caddy is a better move. Slapping another trailer behind it would be awesome, though! The reese hitch caddy would only be used for those light high volume items. At the very least the reese hitch and flat 4 connector could be used to hold a 3rd brake light. Saw this Brazilian Chevrolet Celta (basically a rebodied Opel Corsa B) today. The metro-trailer combo can move a couch, washing machine, queen size bed, most home improvement jobs and stuff like that no problem. I don't think it will hold up to land scaping or roofing work very well. That's where paying for delivery / removal makes sense. The higher the value of the payload, the more sense it makes to transport it yourself (would be one way of looking at it). Hauling gravel, dirt or a roof tear-off doesn't. Plus where one has to go to obtain or dispose of that kind of load tends to be unpaved, and rough. My pickup, like most cars, is optimized for on-road. The threatened loss of a $300 tire "pays" for someone else to haul some loads, trailer or no. I dumped the last roof I did for about $70. That was mostly to get rid of 16 sheets of water damaged plywood that came off the roof. I was able to dispose of the normal tear off material for free. The point is to keep the trailer for the convenience/cost-savings of high value loads. Anyone claiming that some of these little trailers are up to landscaping or roof tear-offs seems not to have done them. Jobs where the estimates are by the cubic yard. That would be with any single-family non-attached house. Does U-Haul rent dump trailers? No. Do they rent large open trailers? No? Why, because the uses to which they are put tear the hell out of them. In the world of big trucks, gravel-hauling, rock-hauling, etc is considered bottom-feeder. No money. Tears hell out of the equipment; tractors on their very last legs, etc. Rent the HD trucklet for the container gardening delivery (bags), and hire a dumpster for roof tear-off. 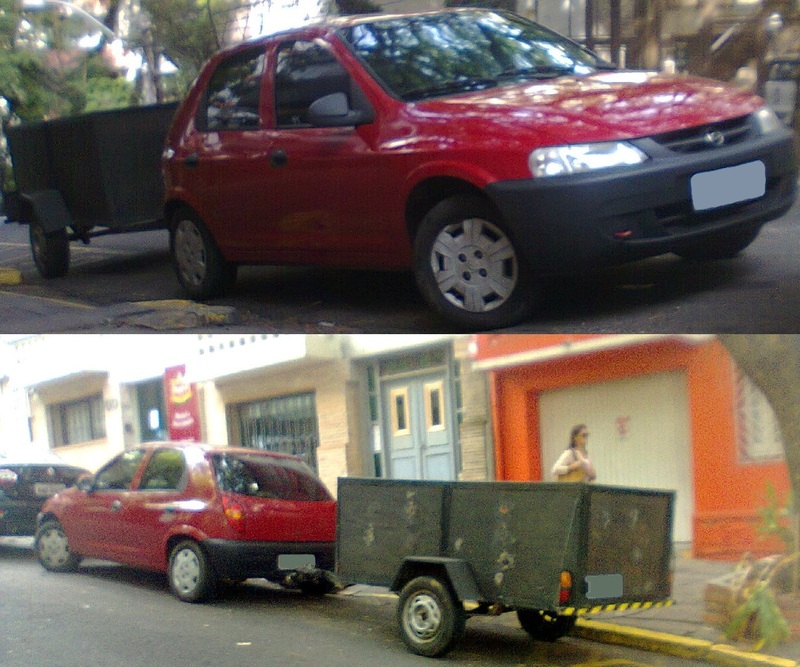 Car + trailer is a better solution over a pickup, but it is still within a limited range. In hampton virginia back in 2007 I rented a dumpster for the shed I tore down. They charged me $280 in 2007, had I known that I would have just burned it in a barrel over the course of several weeks. This is after they charge me about $90 every 2 months for "waste disposal". Some time between 2007 and now, Waste Management took over the dump and things got a lot more expensive so I didn't even want to know how much a dumpster costs now. Most cities will give you 1 free trip to the dump, per address per year, nope, not the city of hampton. I replaced the roof there may of last year. Plan was to dispose of the shingles in my trash can and the neighbors trash can (the house was vacant and they had 2 trash cans for some reason) and in the trash cans accost the street with people I am friends with. I got to see a one arm bandit style trash truck try and lift several 400+ pound trash cans. For once I didn't feel ripped off paying $40-$50 a month for waste. I did not plan on having to tear off 10 to 20 sheets of water damaged ply wood and several rafters, resulting in a $70 trip to the dump to drop off one trailer full of ply wood, had I known they were going to charge any where near $70 we would have explored other options such as a burn barrel. I'm from Maine and use to a trip to the dump costing no more than $20.